Jane Crawford of HB Flour Mill in Hebden Bridge makes Pennine Pasties specially for us. They are utterly delicious  not surprising as the ingredients are always excellent. We offer up to six pasty varieties at present depending on season, including the Keralan potato curry (mildly spiced south Indian curry with coconut milk), Mushroom & celeriac, Pennine Pasty (like Cornish only MUCH nicer and no meat, of course), Cajun spicy bean with spices from southern America, and Jalapeno & cheese pasty (yes, this is vegan and is totally delicious), plus Sosage rolls (with Linda McCartney's vegetarian sausages in a tomato sauce). At the moment we have the new Crawford Haggis Scottish pastie  made by Jane  which is delicious. 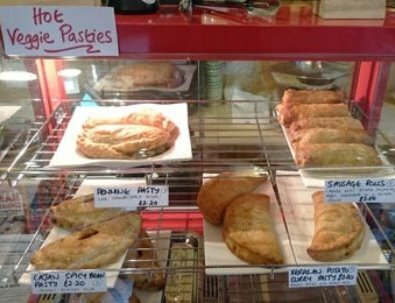 The pasties are all vegan (not gluten-free) and are a good size. They are sold hot from the pie warmer. Why not have a pasty with a lovely organic salad and homemade coleslaw in our café? Return to 'What we sell'.